so that only good-quality products are produced. (control charts, histograms, process capability indexes, etc.). 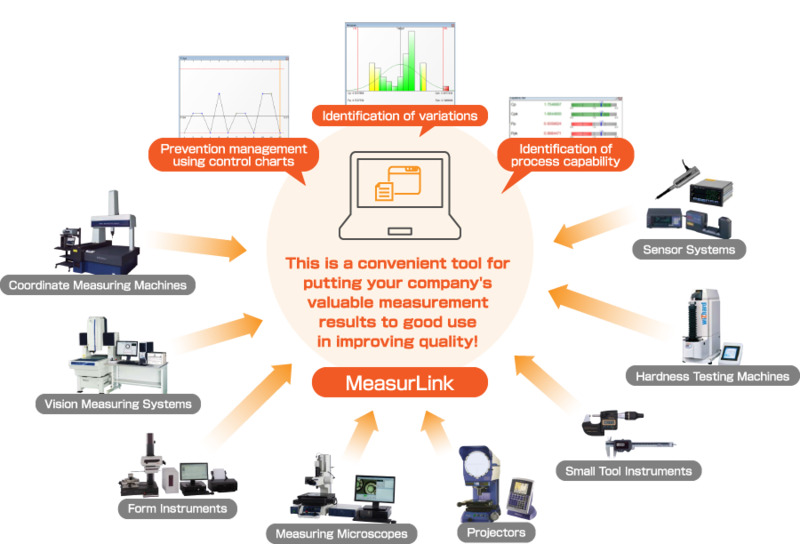 Gather real time data from all network-connected measuring devices and then forecast defect occurrence using statistical process control. good use in improving quality. 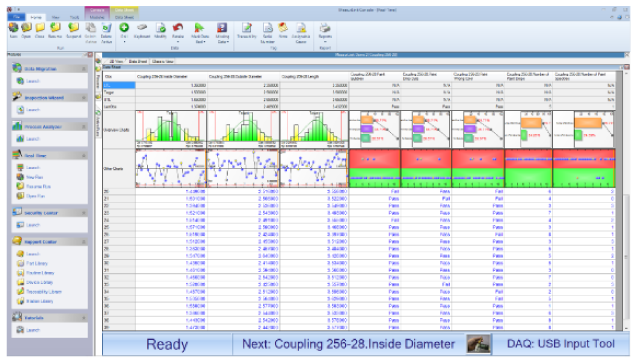 Diversely varied data collection screens are provided, including statistical analysis results, data lists, work instruction image displays, etc. Screen displays can be easily switched to match operator objectives. 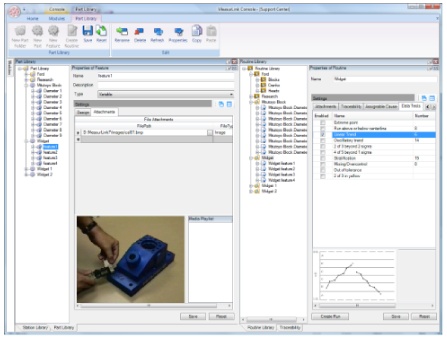 Individual measurement values can be displayed in tabular format to show multiple measurements in an easy-to-understand manner. 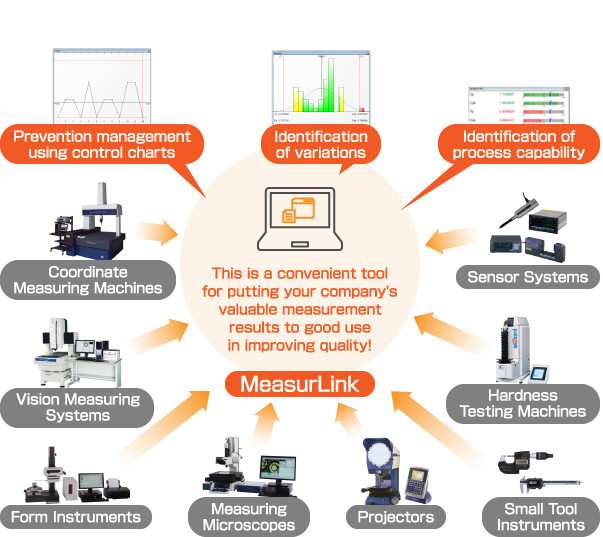 With work photos and drawing data in the background, measurements can be displayed using connecting lines, and these documents can be used in place of work orders. Also, the results of tolerance judgments can be shown with frame colors. With document manager control, flexible screen layouts are possible. *Switch display by clicking on tab. Using the diverse range of statistical analysis and display functions, you can obtain results applicable to your particular situation and objectives. 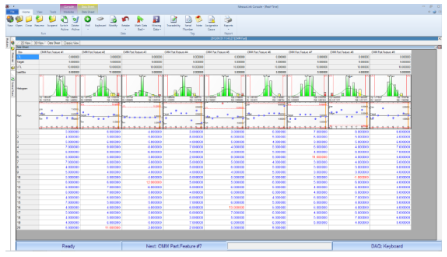 Continuous values: Xbar-R, Xbar-s, X-Rs, EWMA control charts, histograms, run charts, pre-control charts, tier charts, box plot charts, meter charts, indicator bars, multivariate control charts, etc. Maximum value, minimum value, standard deviation, average ±3σ/ 4σ/ 6σ, process capability indexes (Cp, Cpk, Pp, Ppk), defect rate, etc. A warning is sent to the operator when abnormalities (Out of Tolerance, Out of Control Limit) occur. The warning method can be selected as a pop-up window display, email notification, log file entry, etc.